This text was written to be used as a companion to my 2-Minute Neuroscience video on the optic nerve. Some of the deficits caused by damage to the optic nerve can be a bit confusing when you first learn about them. The deficit caused by damage at point A in the image to the right, though, should be fairly straightforward. Because damage at A causes the loss of all of the information coming from the right eye, it leads to blindness in the right eye. The deficit caused by damage at point B is where things get a little more difficult to understand. To wrap your head around it, look at the image below and to the right. It shows that visual information from the left part of the visual field (the red side of the line) ends up hitting the temporal side of the right retina (the side closest to the temple). The visual information from the right side of the visual field (the green part of the line), hits the nasal side of the right retina. 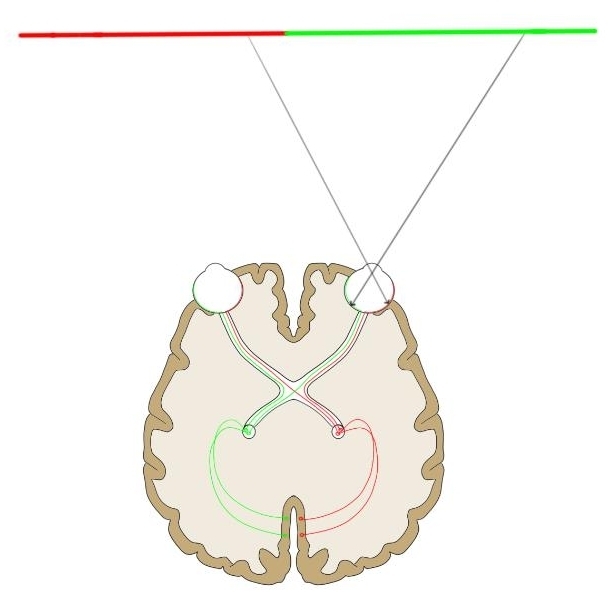 Now, look at the course of the right nasal (green) and right temporal (red) fibers (you may have to click on the image to expand it to see this). You can see that the nasal fibers cross over to the other side of the brain, while the temporal fibers stay on the same side of the brain. A result of this is that information from your right visual field is processed on the left side of your brain (and vice versa). 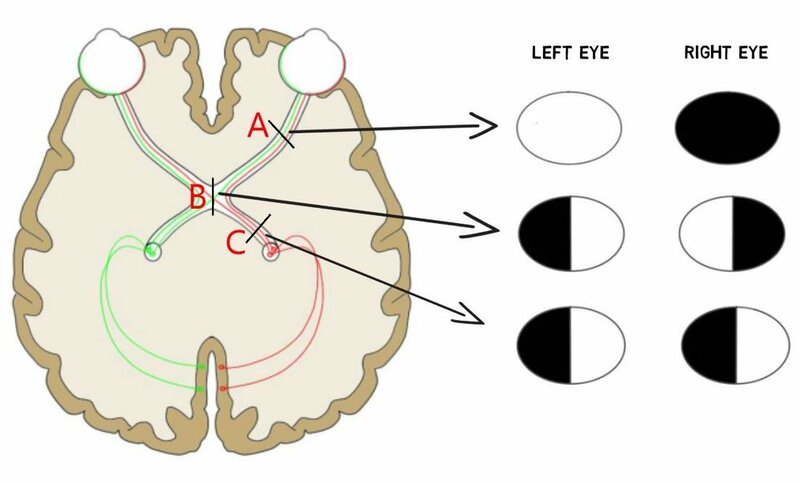 Thus, when there is damage to the middle of the optic chiasm (point B in the figure above), it causes the fibers that are crossing over (from the nasal side of each retina) to be damaged. For the right eye, the nasal fibers are only getting information about the right visual field, whereas for the left eye they are only getting information about the left visual field. Thus, damage to the fibers coming from the nasal side of the right retina leads to a loss of information about the right visual field in that eye. Damage to the fibers coming from the nasal side of the left retina leads to a loss of information about the left visual field in that eye. The temporal fibers aren’t damaged since they don’t cross over in the optic chiasm. Damage at point C involves the optic tract. At that point, the right optic tract carries information from the temporal fibers of the right retina and the nasal fibers from the left retina—both of which deal only with the left visual field. So damage to it causes blindness in the left visual field of both eyes and leaves the right visual field intact.